If the cover accurately expressed the feel and content of the novel, and the cover embarrassed me, what did that say about my relationship to my work? Really nice piece. Then We Came is the only novel I’ve reread, but I am now tempted to revisit The Unnamed. It’s hard with Ferris; he reads easily and therefore it’s tempting to rip through his writing (I know I did this on his latest), but there’s much to savor there. In ways, I wish his writing was a little more ‘difficult’, but then he’d be subject to all the form-over-function hand-wringing plagues contemporary lit. Thanks for this smart, insightful essay. There was something about Ferris’ first two books that has really stuck with me, and this essay helps me understand what it is. To be simplistic, Ferris’ work is profound and wise about contemporary society, without being didactic or superior. I agree that The Unnamed is underrated relative to Then We Came to the End, and this piece makes me move To Rise Again to the top of my “to read” list. This is a well-written and illuminating essay. However, it does not support the statement made in your first sentence. It seems unfair to accuse reviewers of misunderstanding Ferris without offering any actual evidence of this purported failure. It also seems unfair to suggest that even in the course of praising Ferris’ debut novel reviewers, by essentially not “getting it”, somehow created the conditions for his sophomore effort to flop. Perhaps this all could have been avoided if Little, Brown had taken out a full page ad in the New York Times so Ferris could shout STOP LAUGHING YOU GUYS, I’M SERIOUS! from the rooftops. Great piece, made me want to read Ferris, who I’ve, for some reason, been instinctively avoiding. Better written and more interesting than most essays here (some people don’t understand how to develop an argument without incessant self-promotion), but your last paragraph “have always lay” should be ‘have always lain’. It may be of some minor interest to you that your review inspired me to acquire and read Ferris. I am fifty pages into “Then We Came to the End,” and loving it. Not all of it–I do find some of the broad satirical characterizations of the employees’ modern cultural superficiality sort of bland and de rigeur. Then again, this broad satire does set up moments of surprising depth and humanity, like when a character quotes Emerson about everyone being capable of sublime thoughts. So, I don’t know. But beyond that, it is indeed very funny, and the narrative control, as the review correctly assesses it, is exquisite and really impressive. When I first read Then We Came to the End, I gasped because of just how real Ferris is. Yes, he has a pitch black sense of humour and specialises in the minor exaggerations, but I think he also just has a great ear for the rhythms of human interaction. For the different pauses and stutters and half sentences that make up a conversation. I couldn’t relate much to the Unnamed but again, there is something so real about the relationship between Tim and Jane even in a fantastical plot. Thoughtful writing, refreshingly divorced from callow identity politics and fulminations about hot-button “issues.” Strong piece of literary criticism. Would love to see more of this quality from The Millions. I think it’s a shame that the people who write for the Millions don’t work harder to find writers to champion. 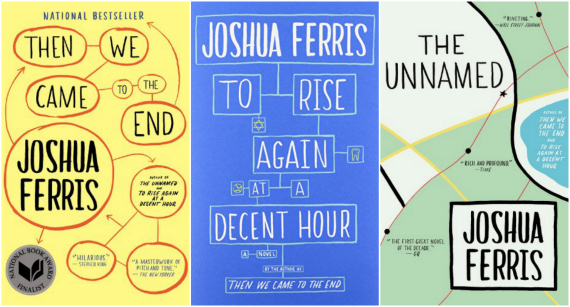 Joshua Ferris doesn’t need a PR push. Someone like Ken Kalfus does. People should know about Matthew Roberson as well. These are just two novelists working in the same vein as Ferris, but who obviously don’t have the marketing contacts, nor the good grace of fashionability, that Ferris does. I mean, really, how hard is it to promote someone like Ferris? Like I said, work harder, dredge a little deeper. Skimming the surface just isn’t that impressive. Yeah, I’ve heard Joshua Ferris makes millions, flies by private jets, and is opening for Beyoncé. With a single slice of pie, do you know what I like to do? Divide it into infinitesimals among my friends. That way, everything is always… fair. Joshua Ferris has gotten more than his fair share. That’s the point. Let someone else have a bite. Ken Kalfus has won a Guggenheim and was a nominee for the National Book Award. Surely there are more obscure and uncelebrated authors we should be stumping for. Me, for instance! Screw this Kalfus guy, where’s my Guggenheim? Where’s my Millions thinkpiece? @Anon – WHOOOOOOOOSSHHHHH goes the low-flying jet of my point. My point being that if all writers got their fair share, no one would get anything. Excellent essay. As a big fan of Ferris I enjoyed your analysis immensely, as it very much got at the heart of what he does (and does well). I, too, wonder what his next work will look like. I believe, as you seem to, that the next step might be to follow Franzen — i.e. having two smaller works which lead to a culminating larger novel that both distills and expands on his greater themes and style — yet Ferris seems to surprise at every turn. Whatever it may be, I look forward to reading it.